Natural pharmaceutical plants have a great potential in the international market. Due to the government’s New Southbound Policy, China Medical University Hospital (CMUH) established cooperation with India, which is the second largest plant exporting country. On October 5, CMUH held “Taiwan-India Symposium on Traditional Medicine” with the assistance of India-Taipei Association. Three Indian experts on Ayurveda were invited to the symposium, and over 100 Taiwanese experts in Chinese medicine attended. The symposium discussed the similarities and the difference between Chinese and Indian traditional medicine, the commercialization technology, and the topic on health preserving. 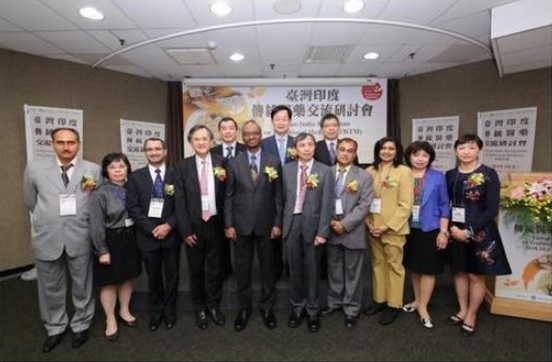 Many distinguished guests were invited to the symposium, such as the president of India-Taipei Association Sridharan Madhusudhanan, the vice president Sandeep Jakhar, and the director general of the Ministry of Health and Welfare, Chinese Medicine division Yi-Tsau Huang. The New Southbound Project Office of Chung-Hua Institution for Economic Research introduced the market status and the needs of Indian medical industry. During 2015-2016, India exported pharmaceutical plants for AYUSH that worth 359 million USD. The export only account for 0.5% of the global market share, which means it a new area worth of developing. The chairman of the symposium was Jung-Nien Lai, the vice superintendent of CMUH. Vice superintendent Lai took the advantages of Taiwan’s strength in Chinese medicine industry and exchange ideas with Indian experts. Representatives from the area of Chinese medicine, biotechnology, pharmaceutical factories and academia all benefit a lot from the pharmaceutical plants development.